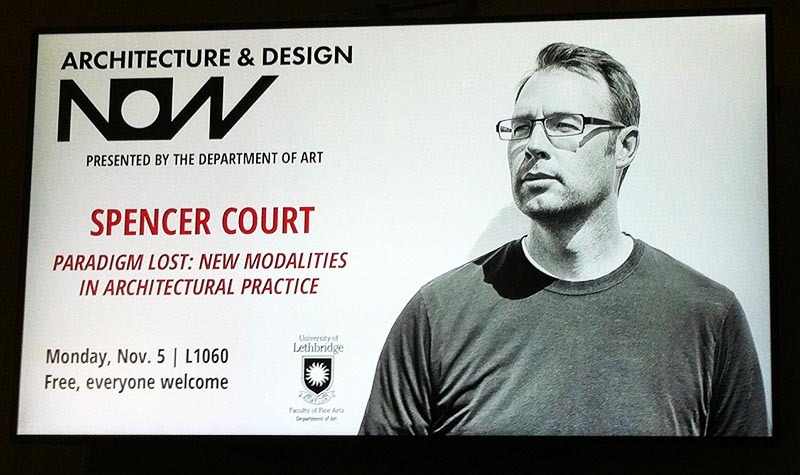 By invitation of the Department of Art at the University of Lethbridge, One One Ten Principal Architect, Spencer Court presented in the Architecture & Design Now Lecture Series as a guest of Professor Victoria Baster on the topic of the collective architectural practice, One One Ten, and recent works. "The structure of future architectural practice may more closely resemble a consultancy of independent collaborative specialists - creative, strategic, research-based, multi-disciplinary - who come together under the guidance of a team director. Spencer will describe external factors shaping architectural practices today and the emergence of his own studio and other nimble practices adapting to the speed of change within professional and related fields in Canada and abroad. 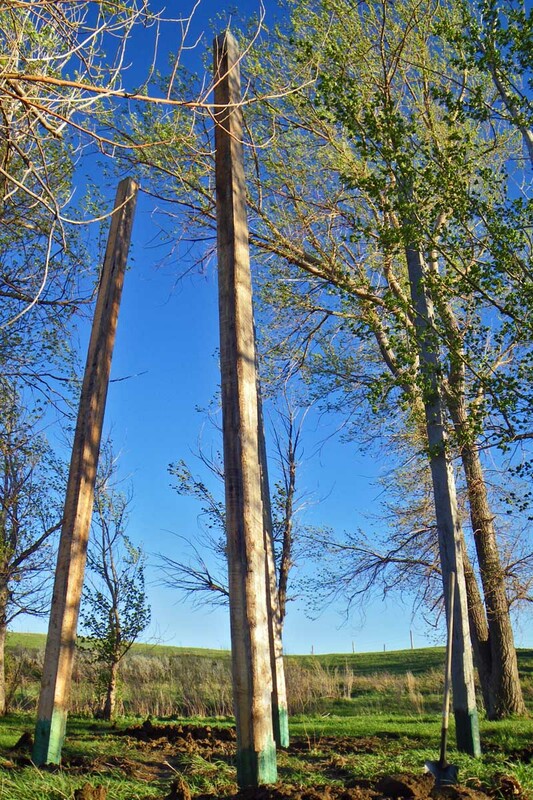 Court will finally review a handful of southern Alberta projects the practice has been working toward since its inception." Your house or building has problems. We can fix them. Read our guide to discover why your neighbour's renovation project cost twice as much and took twice as long, and how to prevent it from happening to you. Choosing the right design professional to work with can mean the difference between an enjoyable smooth experience that is engaging, fulfilling, and sometimes even fun - or a nightmare filled with cost overruns, construction delays, and other unpleasant surprises. We are very excited to have obtained our development and building permits and that we will see this project through construction in collaboration with Cal DeJager, a local custom/luxury home builder and founder of Touchstone Homes. Excavation is almost complete and footing and foundation is about to commence. One One Ten Principal Architect, Spencer Court, presented as a guest of the University of Calgary EVDA graduate program, Professor Tang Lee and course instructor Justin Saly (Principal, Stantec Architecture) on the topic of professional architectural practice and the changing nature of the profession. Without exception, our clients are very successful and intelligent people. Nevertheless, even they have found the process of starting to plan, design, and build their dream home a bit daunting and overwhelming. They find so much conflicting information on the internet, advice from family and elsewhere, that they feel they are going around in circles with no clear way of beginning the process. Saving Money in Design Fees - Good Idea, or Bad? An interesting survey was done a few years ago where homeowners who had completed projects were interviewed about their satisfaction levels. Those who had paid more in design fees (e.g. to an Architect or, in some cases, a licensed professional Interior Designer) were overwhelmingly more satisfied than those who had paid low consulting fees. Why this surprising result? Who to Contact First? Architect or Builder? Only an Architect can best leverage your development plans and design vision from inception to implementation. 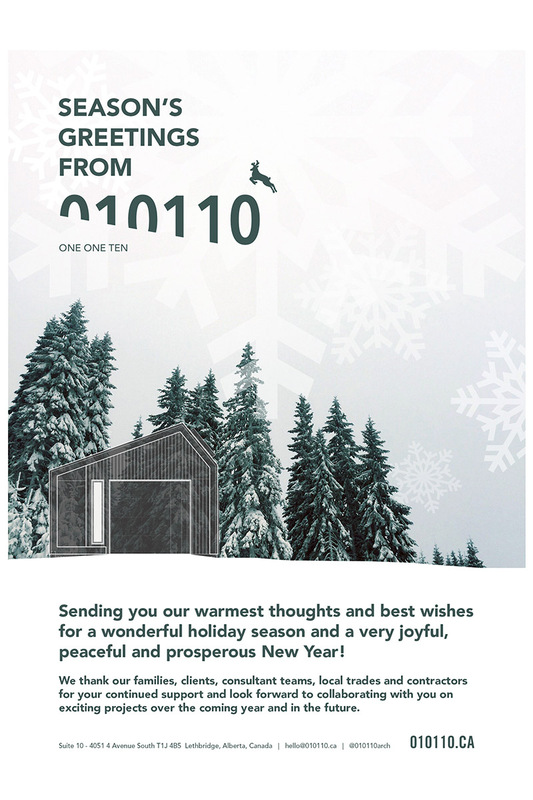 One One Ten sends our warmest thoughts and best wishes for a wonderful holiday season and a joyful and prosperous New Year! We thank our families, clients, consultant teams, local trades and contractors for your continued support and look forward to collaborating with you in the future. Do Architects Really Understand Construction Costs? Some contractors generalize that architects don't really know what things cost and that they tell clients their project will cost much less than they actually do. 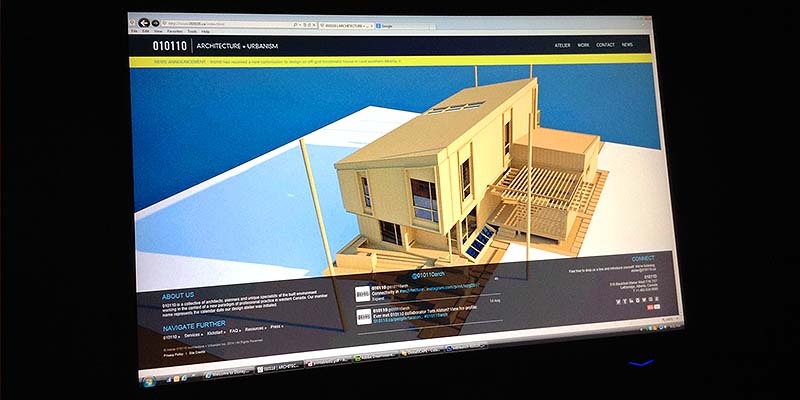 Curious about how our approach to design and project delivery can work for you? Considering a building project? Contact us to schedule your complimentary 'Professional Project Diagnosis' - a 20 minute conversation to gain insightful feedback from our principal architect on your specific project. To better serve existing and new clients, One One Ten has relocated their atelier studio to a cooperative workplace emerging at the office of Ready Engineering Corporation. Ready Engineering is an industry-leading, global provider of electrical, controls and industrial information systems services across a wide array of industries. 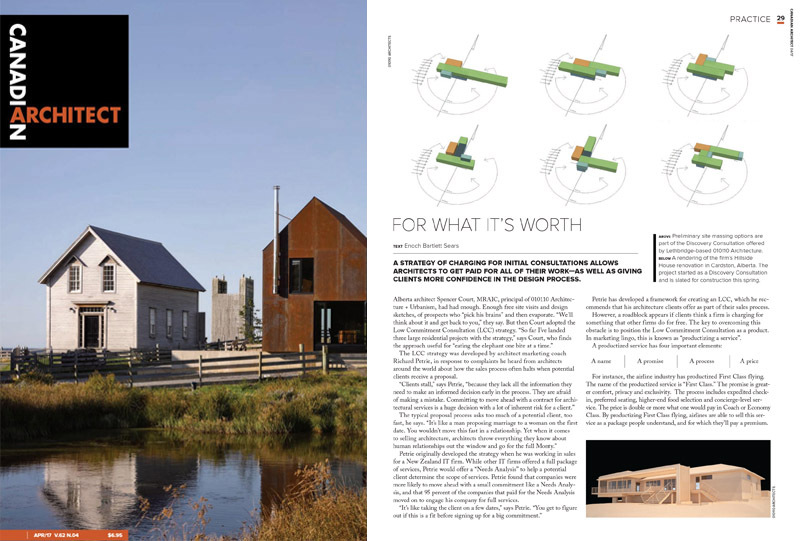 Principal Architect, Spencer Court, was recently interviewed by Enoch Sears, founder of Architects Marketing Institute, for an article appearing in the April issue of Canadian Architect. The most important decisions are the early ones - including selecting an architect that fits you and your project. Whether it is a new building or a renovation, there is a lot of information to gather and assess before design begins. The most important decisions are the early ones. 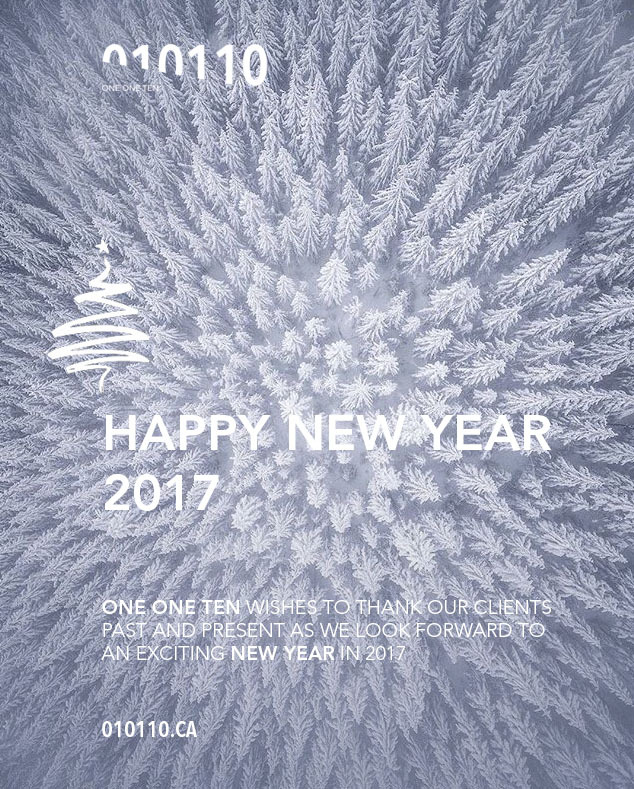 One One Ten wishes you a joyous holiday season and very happy and prosperous New Year in 2017. 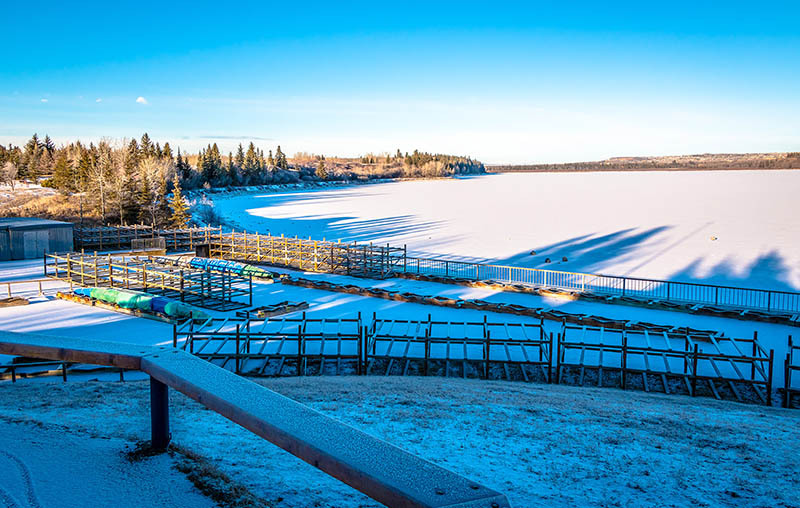 One One Ten has partnered in collaboraton with HFKS Architects and Ground3 Landscape Architects to provide master planning services for the Glenmore Sailing School at the Glenmore Reservoir to create a vision for the future with the City of Calgary Recreation team and community. Work is antcipated to carry on into the spring and shape future development which could occur as early as 2018 at the same time revisions are made to the Glenmore dam to raise the water elevation and increase drinking water capacity for the City of Calgary. 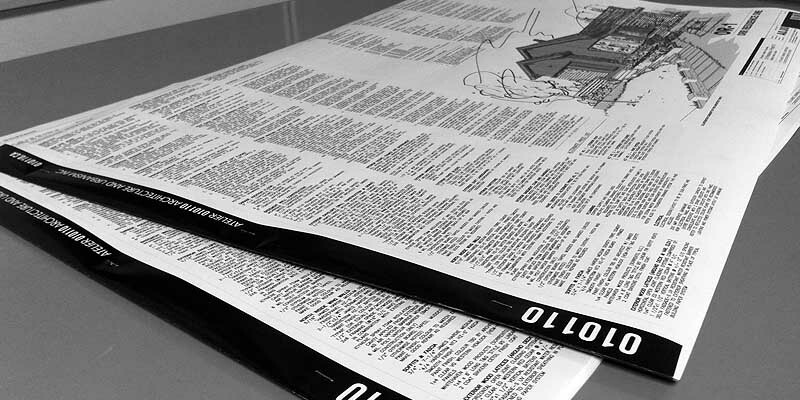 Want to put your own design thoughts down on paper? 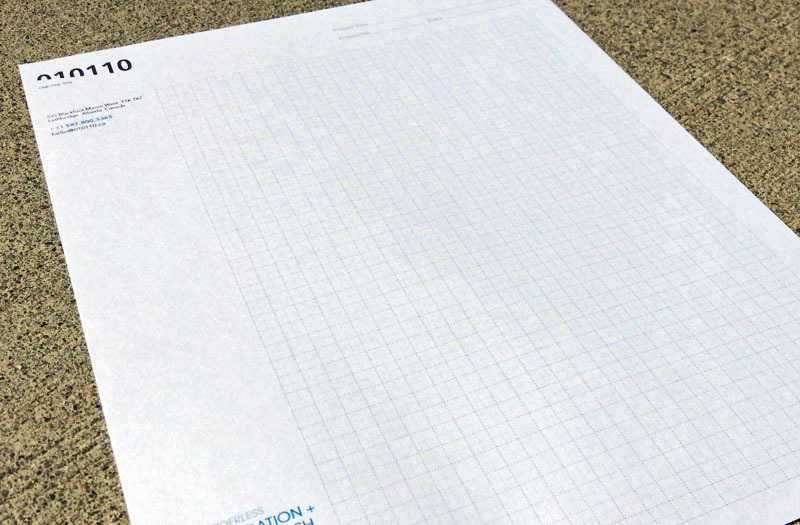 Download and print our complimentary quarter inch scale 010110 sketch pad, pull out a pen or pencil and start laying down your ideas! The busy site of Market at Crossings in West Lethbridge will begin to open its first phase to the public after nearly a year of construction beginning with well-known Canadian restaurant Tim Horton's by mid-May along newly constructed Carinthia Road West. Very soon after Loblaws 'No Frills' grocer and fueling station (completed by Myclex Construction) will be serving the community by mid-June. Boston Pizza and Subway restaurants are poised to open in July weeks prior to Original Joe's bar and restaurant along Whoop-Up Drive. Rice King and other soon to be announced retailers will come along later this summer. Rexall Pharmacy and joint medical clinic at the west end along Whoop-Up are targetting early fall of this year. 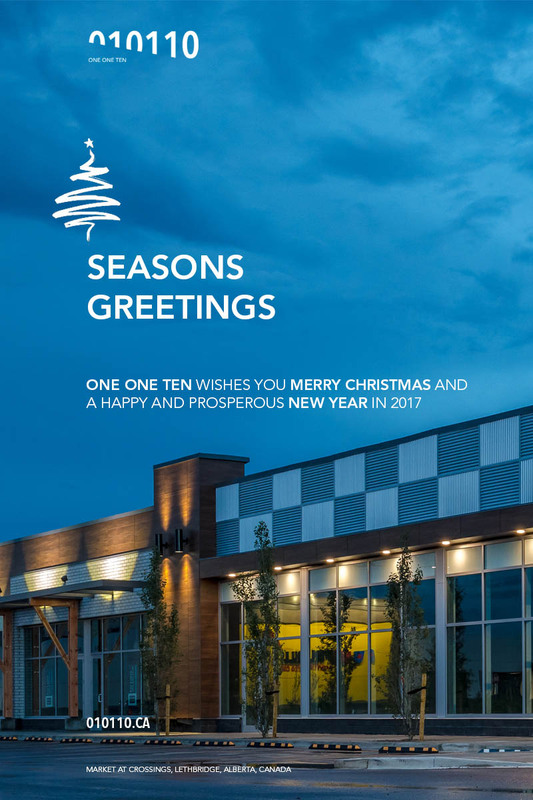 One One Ten partnered with Gibbs Gage Architects and Royop Development Corporation of Calgary to deliver the Market at Crossings, a multi-phase commercial retail development in West Lethbridge. Since last May, One One Ten's role has been to provide construction administration services managing the team as the local architect on site. We have been very pleased to be a part of this new work in Lethbridge which raises the bar for commercial development in southern Alberta. 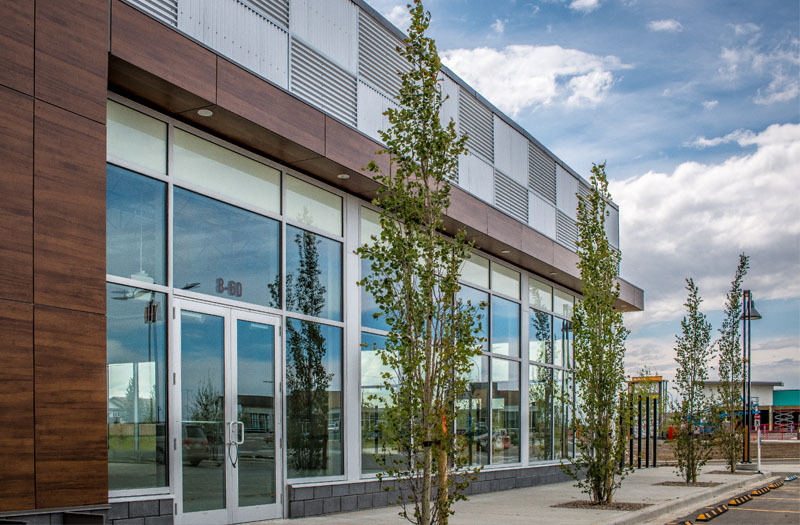 Elan Construction Ltd. of Calgary, Alberta has delivered an exceptional project for Lethbridge in phase one quite unlike most commercial development and been a wonderful team to work with for the duration. We look forward to subsequent phases to be announced in the coming year or so. After nearly eight long years working as a campus planner and architect in the department of Campus Planning & Architecture at the University of Lethbridge, 010110 founder and principal architect, Spencer Court, reaches a much awaited opportunity to leave the institution and focus on full-time architectural practice carrying on with local architectural firm One One Ten, an emerging but established practice based in Lethbridge and founded as a New Year's resolution in January, 2010. 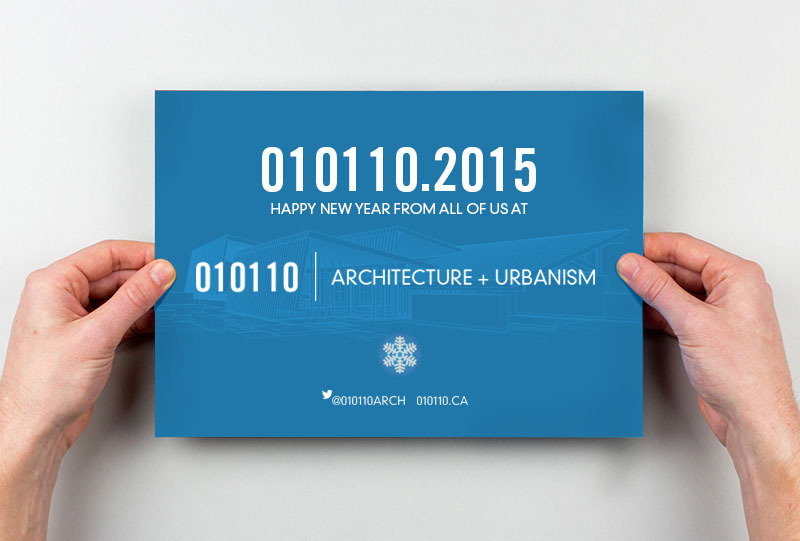 010110 wishes you a safe, joyous holiday season with family and friends and a very happy (and productive) New Year! 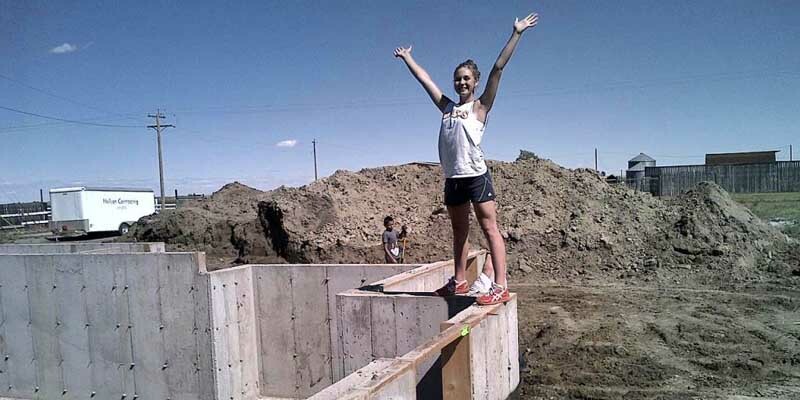 One One Ten begins a new project to redevelop a hillside family residence overlooking the Rocky Mountains, Lee Creek valley and town of Cardston, Alberta. 010110 has teamed with Gibbs Gage Architects and Royop Development Corporation of Calgary to deliver the Market at Crossings, a multi-phase commercial retail development in West Lethbridge. We are pleased to announce that Reside Construction of Coalhurst, Alberta has been selected to join our project team to construct the Ito-Eco Bioclimatic Residence, a high performance single family home in rural southern Alberta. We would like to advise our clients and general public of our local office number and answering service change to better serve you. Our office line is now (587) 800-3365. For convenience, we continue to be reached by our individual directory or general contact page. Wonderful to see Wade Galloway's tribute splitboard on the high slopes! 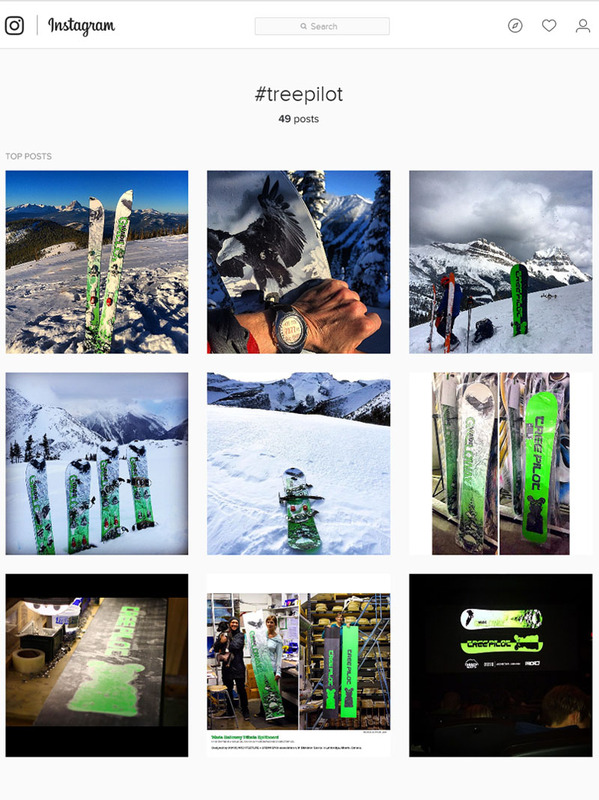 To find out more about Wade's project and our assistance to Blakiston Sports' by providing custom splitboard illustration graphics for Prior Snow (of Whistler, British Columbia) to honor Wade's memory, view the project details or keep up via the hashtag #treepilot on Instagram and join the eagle that still soars on in the backcountry. 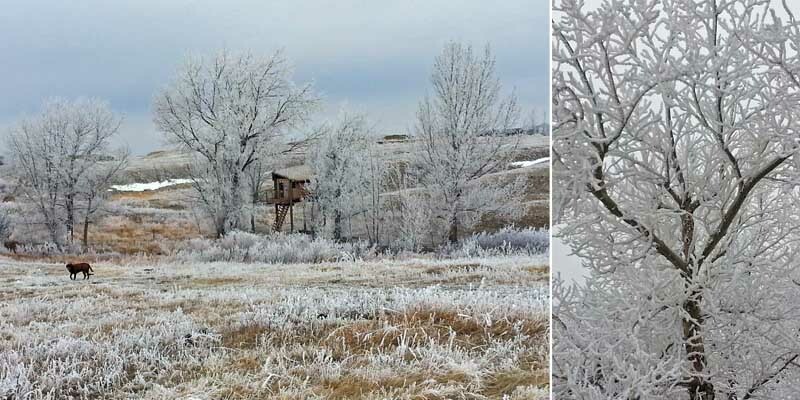 As schematic design work on a new private residence in West Lethbridge progressed in the new year, the project was put indefinitely on hold in order to reflect on the merits of an alternate development site and build strategy liberated from imposed constraints within the subdivision. 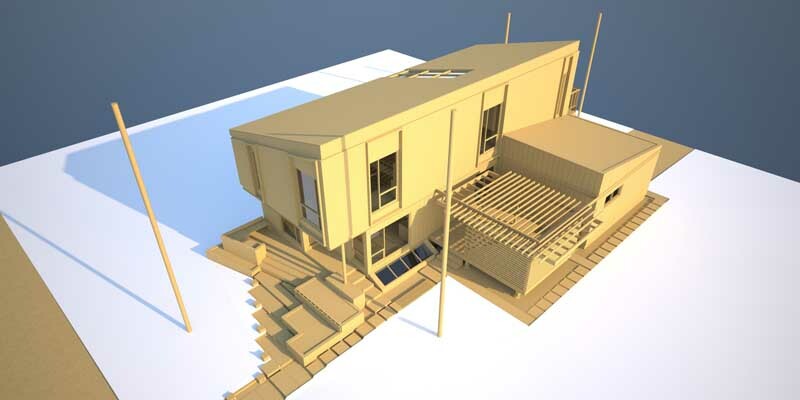 It is our hope that 010110 will be able to resume work to develop this exciting residence project in the future. We wish great success to Chinook High School athletes on and off the playing field, court and track. Go Coyotes! 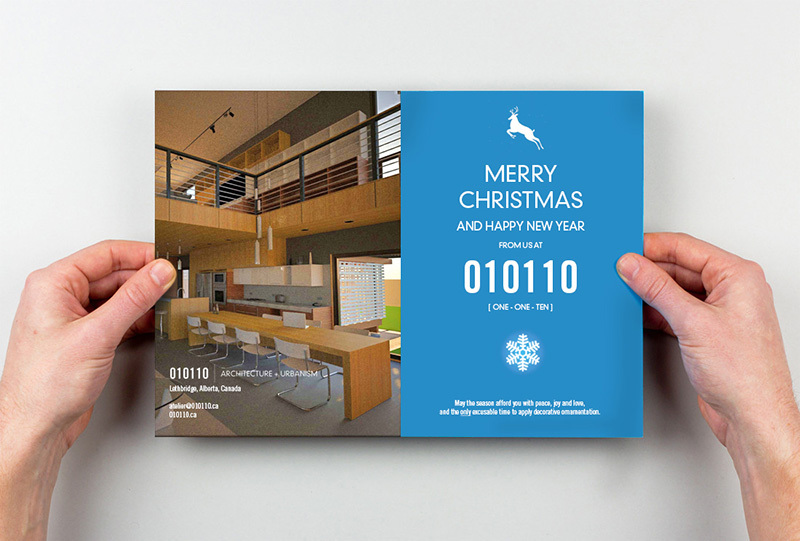 010110 wishes you a joyous holiday season and very happy New Year. As preliminary design stages conclude in our studio, early design work on a new private family residence gets underway in West Lethbridge at the new community of Crossings. In partnership with local Prior snowboard dealer Blakiston Sports, 010110 jointly designed top and base sheet graphics for a Tribute Splitboard in memorial to the late Lethbridge City Councillor and backcountry enthusiast Wade Galloway who was swept away by avalanche on the slopes of Mount Rowe on February 15, 2014 in Waterton Lakes National Park, Alberta, Canada. 010110 is pleased to provide an upgrade release of our web site to enhance client interaction and provide meaningful new areas of information to prospective clients. 010110 has received a new commission to design the Ito-Eco Residence - an off-grid bioclimatic house on a rural site in southern Alberta. 010110's principal architect made a presentation to Mr. Fletcher's grade 7 science class at G.S. 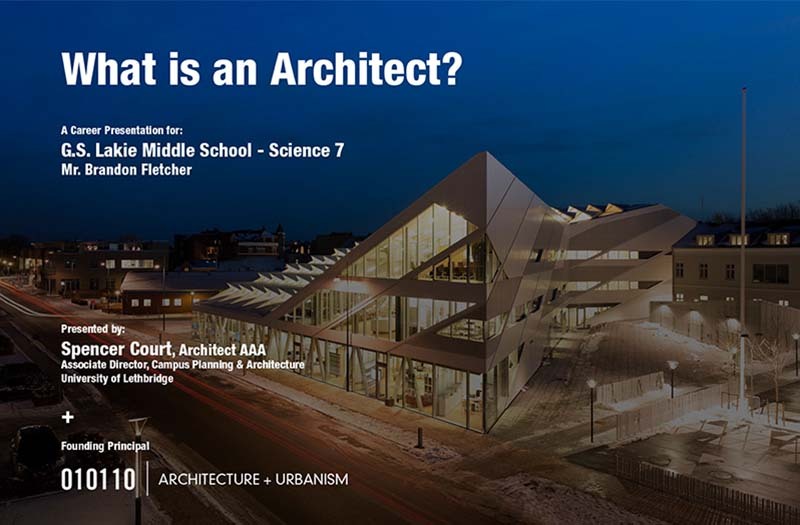 Lakie Middle School on the career minded topic 'What is an Architect?' where budding design students not only learned what architects do, but also how the structures around us influence our lives on a daily basis and how an idea for a building or space becomes ARCHITECTURE. Author and journalist Hadani Ditmars interviews One One Ten principal architect and University of Lethbridge Campus Planner, Spencer Court in a critical retrospective for The Architectural Review on the architectural origins and conceptual genesis of the University of Lethbridge campus. We've gone and done it. Now, in addition to following our musings and interests on Twitter and Facebook, we invite you to come and follow us @010110arch on Instagram. While we don't expect to ever expand to Pinterest, we do recommend you check out these other inspiring architect feeds on Instagram to supplement your appetite for architecture, design and urban conjecture. Congratulations are in order for 010110 collaborator Michael Chu who recently was a co-recipient of a 2013 Mayor's Urban Design Award in Calgary last year. When Michael wasn't recieving awards and accolades his graduate work was being presented in his behalf as part of a class effort at the aceBIM Symposium in Calgary. We are pleased to have his experience and design insight as a team collaborator in our collective. Read more about Michael and his pursuits at his biography page. Wishing you a joyous and safe holiday season and very happy New Year. 010110 is pleased to announce the launch of our new web site. We are excited about our growing online presence to showcasing our work and to communicate what we do as architects and what we value in our communities. Since graduating from the University of Manitoba with a Bachelor of Environmental Design (Interior Design) in 2001, Sheri Krug began her professional career in Edmonton with a focus on providing sustainable design solutions for her clients. 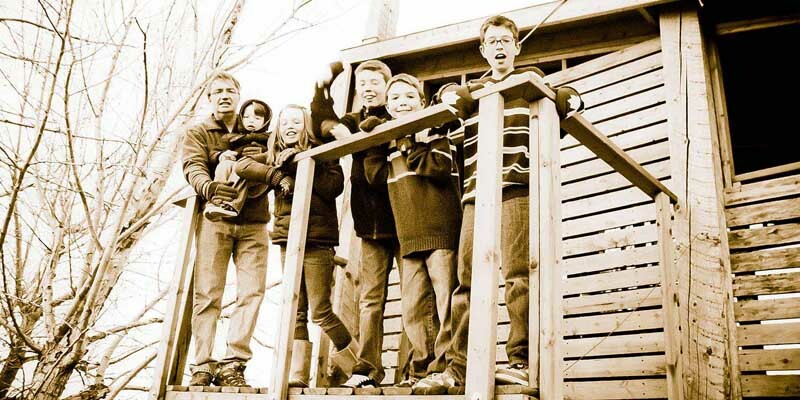 After founding Sheri Krug Designs as principal and lead designer in 2005, Sheri has been an active member in the Edmonton design community as a volunteer, competition judge and also as past chair and co-chair of the non-profit architecture and design collective M.A.D.E. in Edmonton and Edmonton on the Edge. 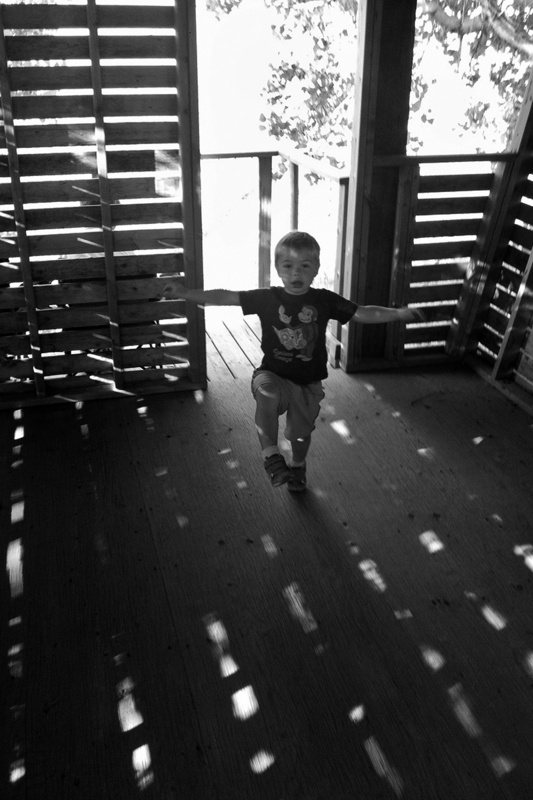 Photographs courtesy of treehouse owner, Morgan Strate. Tom is an innovative and creative thinker who values sustainable design as a means of guiding projects toward smarter and more responsible ways of building and occupying the urban realm. His broad training and experiences have made him highly adaptable and versatile with new challenges and able to develop well considered and appropriate design solutions. In his concurrent role as Associate Director, Campus Planning & Architecture (Facilities) at the University of Lethbridge, 010110 Principal Spencer Court presented the University's new campus master plan in partnership with lead planning team Moriyama + Teshima Architects (Toronto) and Gibbs Gage Architects (Calgary). The long standing Architecture + Design Now speaker series is held throughout the academic year by the Department of Art's own Victoria Baster. 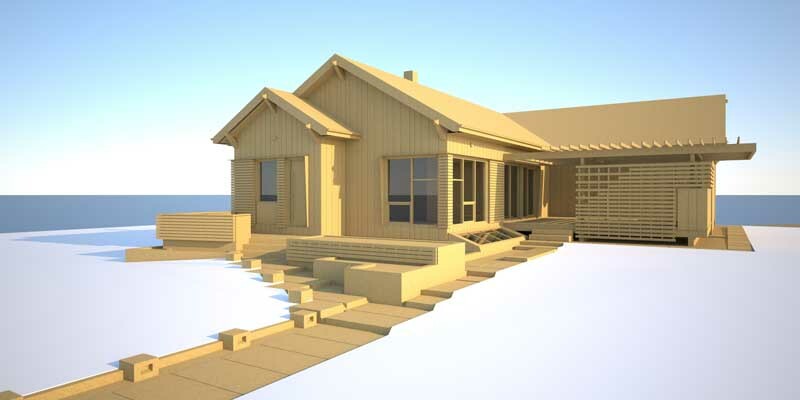 New concepts are quickly emerging for OR-1R, a revised design for a new private residence for a family in rural Alberta. In order from top to bottom: the original intended OR-1 residence relocation and renovation project, the initial OR-1R concept and the second and last iterative design concept. After municipal approvals were granted and then unexplainably recinded, the project has come to an abrupt temporary halt. This event has prompted a fast-track re-design of the dwelling as the house mover is now also affected and unable to accommodate the delayed schedule during the summer move season. Aptly renamed OR-1R(evised), the project is to be entirely new construction utilizing the existing footprint, foundation and plumbing system rough-in originally intended for the previous redevelopment. Foundation, plumbing rough-in and site services tie in now complete in advance of relocating the existing dwelling to the new site. 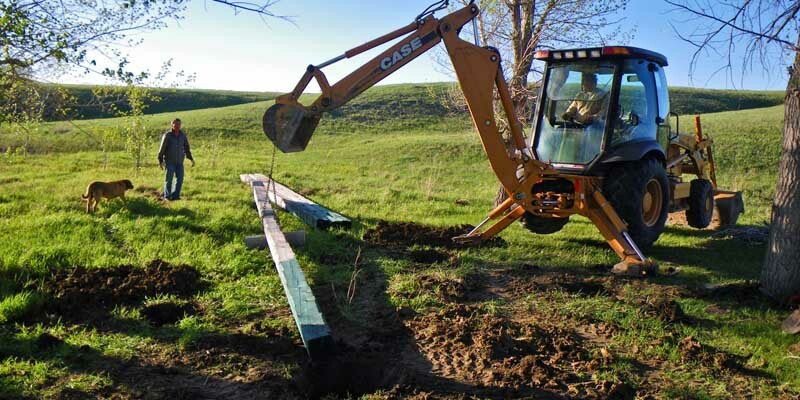 Despite considerable delays (municipal approvals), the project is making progress. OR-1 (Orr Residence - Phase One) contractor is mobilizing with construction to commence now through to the end of summer (in time for the return of school this September). Site preparation and excavation for the foundation are scheduled to begin in a few days. 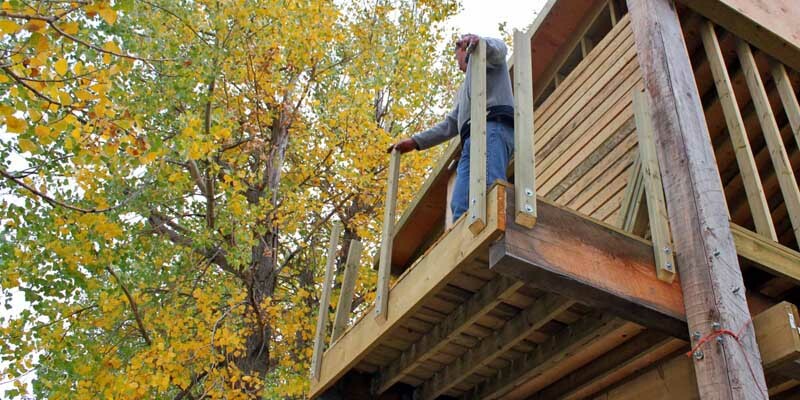 Final details incorporating balcony guardrails and other safety systems are now complete on our rural Treetop House family project. 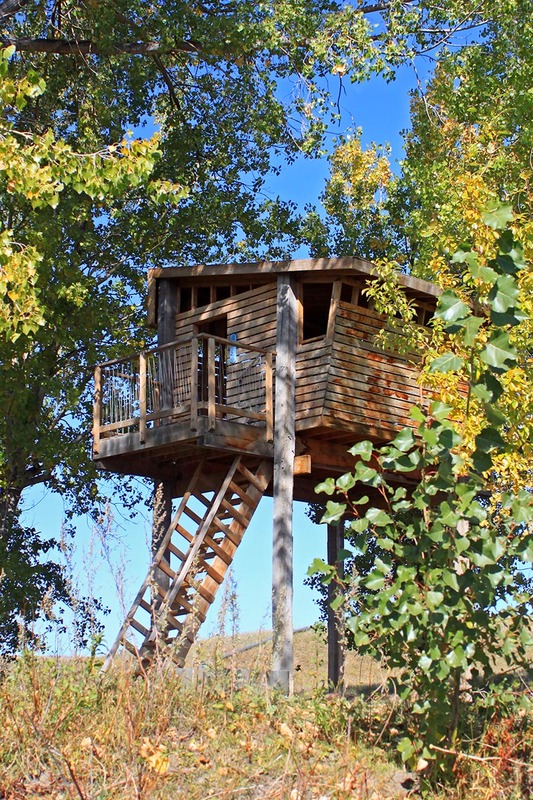 Extended family (and local neighbours) continue to enjoy the treehouse site into fall and winter with a variety of social picnics and other activities. 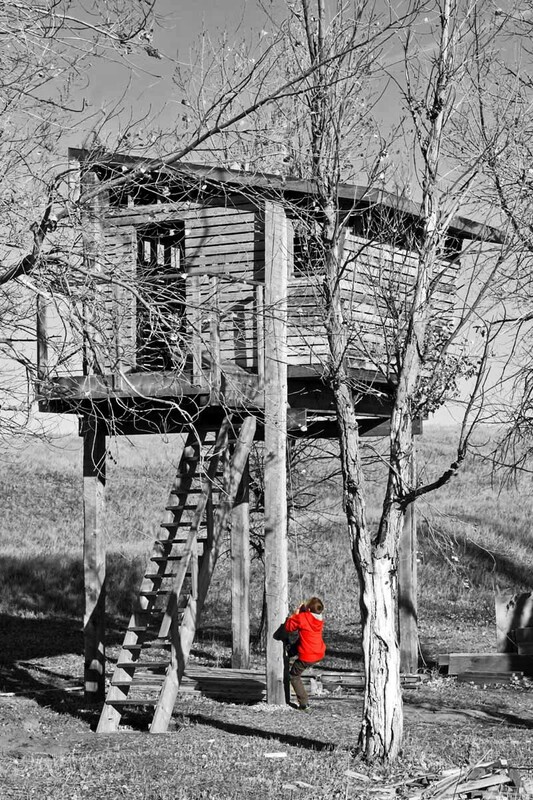 A typical fall scene on a clear day down at the treehouse as a young grandson opens the hatch in advance of gaining entrance to the lofty place beyond the ladder. 010110 is now an incorporated company in Alberta, Canada solely owned by founding partner and architect David Spencer Court. 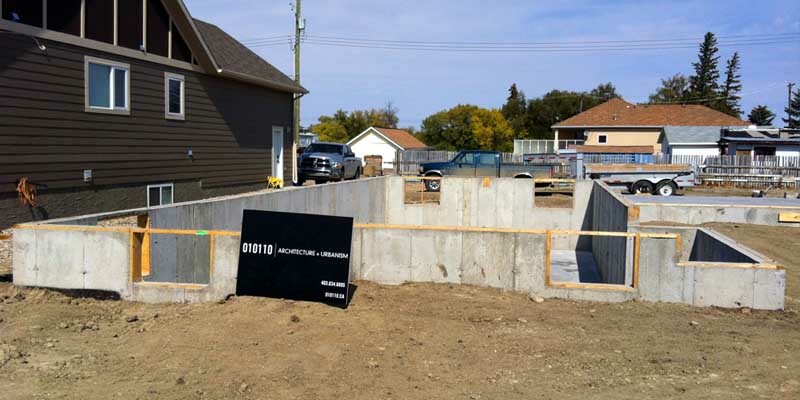 010110 has begun to develop a new residence project for a family of seven in Magrath, Alberta, a rural prairie town just south of Lethbridge. The project will consist of multiple phases, including the relocation of an existing 1920's home to a new site where it will undergo an addition, renovation and complete exterior redevelopment. The family will occupy that residence while phase two of the project continues to develop the a dream residence on the original beautifully treed site in the heart of the community. 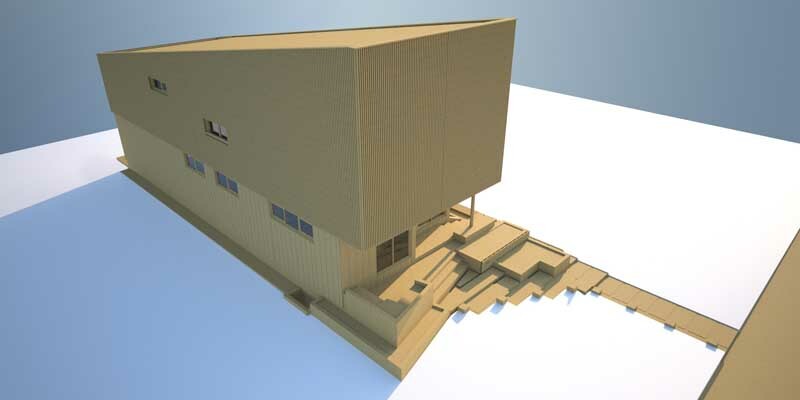 The project has already entered early stages of planning and pre-design. 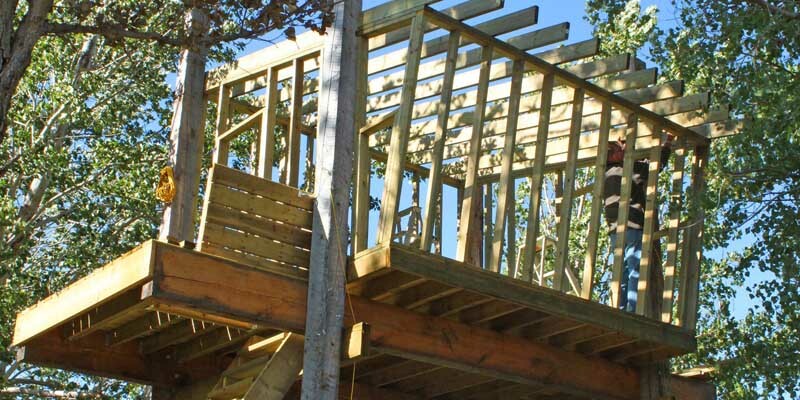 With the supporting beams and upper floor decks in place, framing of the treehouse has proceeded quickly along with roof framing members. 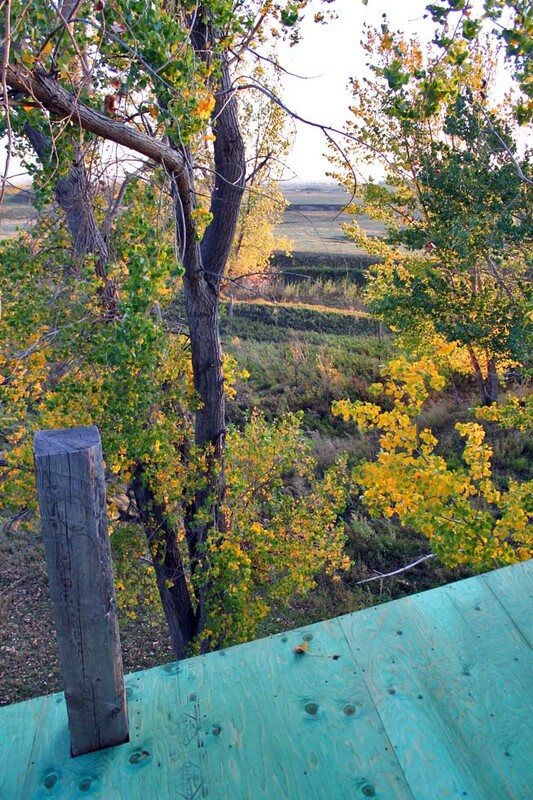 The summer shade of cottonwood trees has provided a comfortable work area for the project. Spencer Court is the owner and founder of 010110. 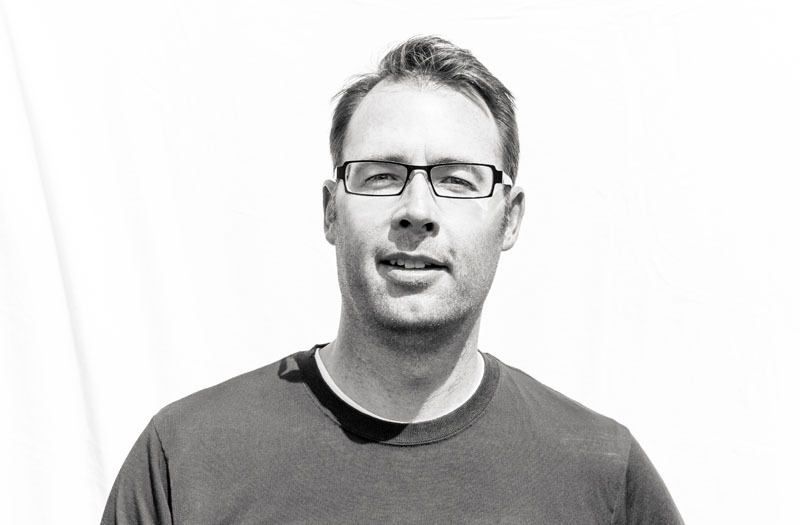 He is a registered architect with the Alberta Association of Architects and a member of the Royal Architectural Institute of Canada. 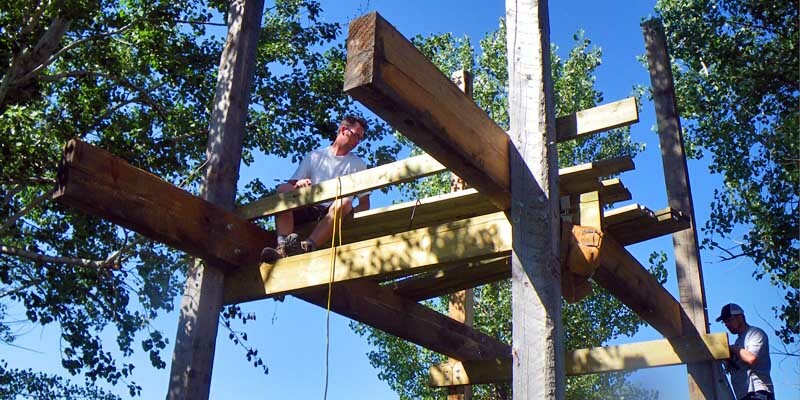 Excavation, drilling and erection of the main structural elements of the treetop house has begun. The work will largely be performed by family members on a time available basis. It is hoped that the majority of the work will be substantially complete by mid summer. Names have meaning as they are derived from relevant contexts. 010110 (pronounced 'one-one-ten') is a Lethbridge Alberta-based architecture practice and 'collective' conceived by founding architect David Spencer Court on the first day of January, 2010. Named after the abbreviated time-code or moniker of that inception date, 010110 is an emerging force for architecture based in Alberta, Canada.